Kayaking, also known as paddling involves traveling on water in a kayak which is a narrow boat operated manually by a double-blade paddle. 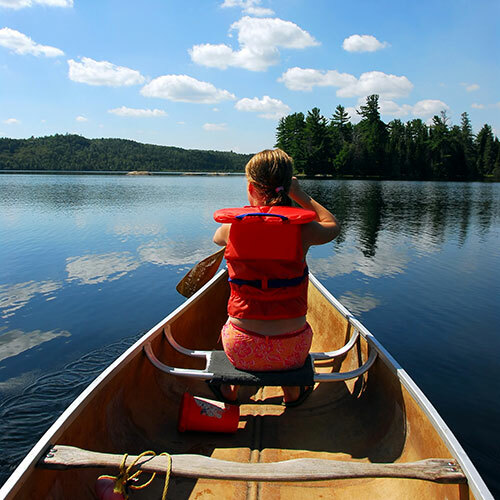 A kayak kind of looks similar to a fishing boat and usually is fitted with a covered deck. There are two types of kayaking; white-water kayaking and ocean kayaking. In white-water kayaking a paddler negotiates waterfalls and rapids and in ocean kayaking the kayak is manoeuvred on a lake or in open water. White-water kayaking is more exhilarating than rafting and requires a great degree of skills. Ocean kayaking is a good option for beginners who just want explore the rivers and lakes in a relaxed and pleasant manner. The kayaks were invented for hunting purposes by the Inuit people of the Arctic region. Initially kayaks were powered by single-bladed paddles which the Eskimos used to hunt seals. Thus the literal meaning of kayak is ‘hunter’s boat’. Courtesy to a person named John McGregor, kayaking later emerged as a sport or a recreational activity. In the year 1845, he made a kayak based on the drawings of narrow boats that the Eskimos used. This Scotsman used a two-bladed paddle in the kayak and named it ‘Rob Roy’. McGregor used to kayak all over Europe, in rivers and on lakes. He even wrote about his kayaking experiences in a book named ‘A Thousand Miles in the Rob Roy Canoe’ which quickly gained popularity and became a best seller. He also established the Royal Canoe Club with other water sports enthusiasts. In 1873 this club organized the first competitive kayaking event. In Berlin Olympics, 1936 kayaking became an Olympic discipline. Over the years it has gained huge popularity among water sports lovers. Colorado, home to numerous rivers, lakes and reservoirs is the best destination for water sports enthusiasts. According to Anouk Govil, who is an entrepreneur by profession with a passion for water sports, Colorado is one of the best places for kayaking. Following are the five places where you can go for kayaking in Colorado. Colorado River: Perfect for recreational kayaking, kayakers just can’t get enough of this fast moving river. One of the main perks of kayaking here is you will go through many beautiful canyons and picturesque surroundings. The water in the upper section of this river is usually calm and beginners and families kayak over here. The lower Colorado is more exciting and has some white-water features so experienced kayakers prefer this part of the river. Arkansas River: Unlike Colorado River, it is not suitable for those who have just started to learn kayaking. Arkansas River is more preferred by kayakers who are highly confident about their abilities. Lake Dillon: Located at a high altitude, the water of this lake is pristine and very cold. Because of its location the weather here sometimes get very windy so do not take the risk of kayaking then. Pueblo Lake: The exquisite and serene surroundings of Pueblo Lake make it a great place for a laid-back kayaking. Boulder Creek: Boulder Creek is for kayakers who want a strong adrenaline rush. Its fast moving water and rapids are not for beginners. Anouk Govil first kayaked at the tender age of 8. The best season for white water kayaking in Colorado is from May to June.